Also: "Royal Challenger" and "Challenger DeLuxe"
he Challenger was a school pen that was first introduced in the february 1934 Parkergram, during the Vacumatic era. It was a button filler and was made out of the same plastic as the early marbled Vacumatics. 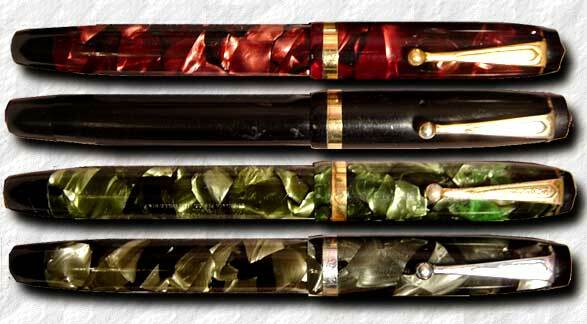 The Grey marbled version had nickel trim, the Red marbled, Green marbled and Black pens had gold plated trim. The clip screw and blind cap were in black plastic and were somewhat pointed at the ends, like the tassie-ringed Vacumatics but sans the ring. The body had a plain, medium sized band and the newly designed clip had the imprint "Parker" inside a raised, elongated "diamond" and a ball ending. Pencils were also offered. The pen, offered in two sizes, was 122 millimeters long (Slender) and 132 mm (Standard) when closed. The Standard and Slender sold for $2.50, the pencil for $1.25. As a comparison the Vacumatic Standard of this period cost $7.50 wheras a Parkette Standard cost $1.25, which puts the Challenger in the middle as a "gift" school pen. "chunky" feel, as opposed to the finer marbled plastics of the Standard. The black clip screw was also smaller. Both Standard and Slender models were offered. The DeLuxe Challenger with ball clip. he third addition to the Challenger line in 1937 was the top-line Royal Challenger, which came in a very attractive "Herringbone" design. The first pens had the so called "sword clip", which actually had the form of a dagger. These pens are much sought for by collectors and are often rather expensive. The sword-clip was soon replaced by the "spade-clip", which was a tapered but rounded clip, with the imprint Parker and a stepped design. Like four spades lying upside down on top of each other. The Royal Challenger had three cap bands and sold for $5.00. and the Royal Challenger in silver with spade clip and visiometer ink-vue. Vacumatics, which were also redesigned the same year. Added to the Challenger line was the Visiometer ink-vue, a transparent section that allowed the user to see how much ink was left in the pen. This feature was added to the range of the Parker low end pens; Parkette, Televisor and Duo-tone. The tapered clip of the last Challenger model. 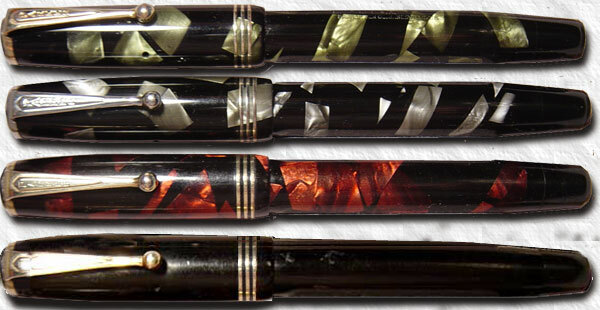 and, in 1941 the attractive Vacumatic Duofold range, These pens were also initially button-fillers. The 1938-style Challenger was however still sold in Canada with the body imprint Moderne, probably to clean out old stock. The Canadian Moderne from the 1940's picked up the features of the Challenger.